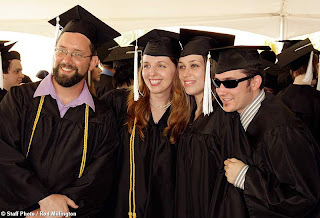 Here's a very quick post featuring a shot that the local newspaper had for my graduation. The bearded guy with the honors cords is me. I actually get along with the other grads in the picture, but we were in line alphabetically regardless. Don't worry, I'll post some art in a second or two.